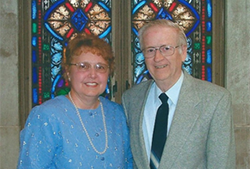 Dan Engstrom attended Bethel University for just one year, while his wife Linda served as a Bethel employee for three years in the late 1960s. Despite their brief time at the university, the Engstrom's experiences at Bethel resulted in lifelong friendships and ignited a passion that inspired the North Shores, Michigan residents to include Bethel in their giving and estate planning. "A charitable gift annuity to Bethel does two things," explains Dan. "It provides income for us for our whole lives, and it also supports the Lord's work. Bethel University produces pastors, missionaries, and others in His service. That's what we want to support." Engstrom's older brother Morris Engstrom '51 S'54 spent seven years at Bethel, first as an undergraduate student and then at the seminary, while Engstrom's own tenure at Bethel was cut short, due in part to a family tragedy. Just a week after returning to Michigan following his freshman year, Engstrom's family home burned to the ground, leaving him with only his car and his painting clothes from a summer job. Without financial means to return to Bethel, he enrolled in a community college and eventually earned a degree from a university in Michigan state. It was also in Michigan that Engstrom met his wife, Linda. Just days after getting married, the Engstroms moved to Minnesota, where Dan pursued a job in computer science. The couple began attending Central Baptist Church in St. Paul, where they became reacquainted with Paul Finlay, Dan's former Bible professor at Bethel. It was Finlay that encouraged the Engstroms to consider giving a charitable gift annuity to Bethel. "At that time, we hadn't done a lot in retirement, and Dr. Finlay suggested we give a charitable gift annuity to Bethel as a way to generate retirement income," says Linda. Linda says the couple gives to Bethel because they believe in what it stands for. "When considering our estate planning, we decided that instead of leaving money to Bethel in our will, we wanted to give it now," she says. Engstrom's career eventually led the family to California, where he held aerospace-related jobs for Lockheed Corporation, Hughes Aircraft Company, and Northrop Corporation, working on the B-2 bomber. The Engstroms met several more Bethel connections there, including Dan Baumann, former Bethel professor, who pastored the first church the Engstroms attended in California; and Leland Eliason, retired dean and provost of Bethel Seminary, who also served as their pastor there. "Eliason's passion for Bethel inspired us to support the seminary," says Dan. Engstrom maximized giving to Bethel Seminary through employer matching gifts. When he retired, he emphasized charitable gift annuities in his retirement planning. The couple now has 10 annuities with Bethel. "It's a way to give to the Lord and generate retirement income," says Dan. "Through people we have known and their passion for Bethel, we've come to love the school ourselves," says Linda. "Bethel's vision has always focused on the whole person, emphasizing both the spiritual and the academic. That's part of our decision for giving to Bethel." Learn More about Charitable Gift Annuities and how you can advance Bethel's mission.